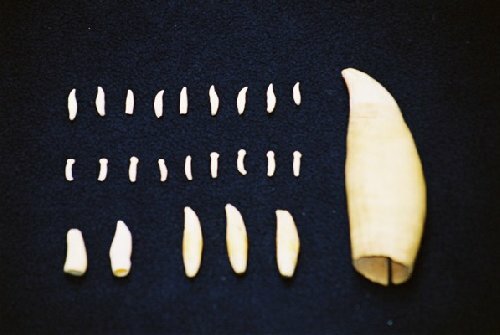 The teeth can be used to identify families and even age cetaceans once they have passed away. 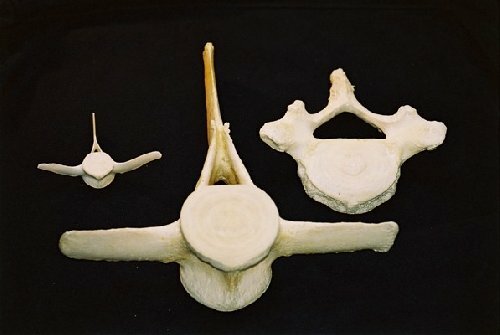 Top left and middle, lumbar vertebrae from a harbour porpoise and pilot whale respectively, and top right, thoracic vertebra from a pilot whale. With 37 members, the delphinid family is the largest and most diverse of all the odontocete families. Whales, dolphins and porpoises belong to the Order Cetacea. The following taxonomy provides the most complete and up-to-date* reference in terms of current research in the field of cetacean classification. The list provides common (vernacular) names, scientific names and the names of subspecies where these have been described. A number of the subspecies below have not yet been named, and in such cases these are simply referred to as subsp. in the list. The common names assigned for these animals are typically based upon their distribution. The links below are directed to a detailed fact sheet for those cetacean species most commonly found in the Moray Firth study area. Baleen whales are filter feeders which sieve food from the seawater with baleen – hair-fringed plates made from keratin (the same material as our fingernails). The minke whale is the most common of the baleen whales in the Moray Firth, although other mysticete species recorded in these waters include the fin whale, sei whale and the humpback whale. This group contains the beaked whales (Ziphiidae), the freshwater river dolphins, the beluga and narwhal (Monodontidae), the dolphin species (Delphinidae), the porpoises (Phocoenidae) and the sperm and pygmy sperm whales (Physeteridae and Kogiidae). Of the beaked whales, only the Northern bottlenose, Sowerby's beaked whale and the Cuvier's beaked whale have been recorded in the Moray Firth. Sperm whales sporadically occur in this area of the North Sea, but the individuals entering this shallow Scottish firth usually become stranded on the beaches. * Rice, D.W. (1998). Marine Mammals of the World. Systematics and Distribution. Special Publication No.4. The Society for Marine Mammalogy. International Whaling Commission (2001). Annex U. Report of the Working Group on Nomenclature. Journal of Cetacean Research and Management.3: 363 - 365. Hoezel (Ed.) (2001). Marine Mammal Biology: An Evolutionary Approach. Blackwell Science Ltd. Oxford.